The details of events for this year’s Upperchurch Walking Weekend on Nov. 9th, 10th and 11th have been announced recently. There are eight walks in all including two new one off walks as well as the usual favourite trips through the hills and valleys of the scenic Upperchurch area. The annual event has been attracting large attendances since 2006, with visitors lured by the combination of exercise, good company, entertainment and the famous stew at the end of the walks. The first of the two new walks this year is a 12 km road walk on the opening Friday night on the Moher-Finnahy route, which is probably not familiar even to many locals. 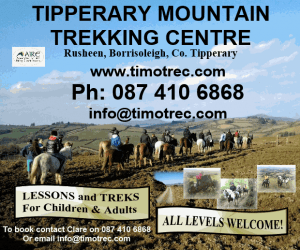 There is also a shorter 7 km walk on the same night with both walks starting at 7.30 p.m. Activities on Saturday start with the testing 18 km Hills of Upperchurch Walk at 10.00 a.m. There will be shorter walks of 8 km and 10 km on the Birchill and Knockalough routes starting at noon and 12.15 p.m. Please note that the Eamon an Chnoic walk will be on Sunday only at 12.30 p.m.
Sunday presents a once in a lifetime opportunity to walk from Thurles to Upperchurch via Farneybridge, Moyaliffe Hill, Gurtahoola and the summit of Knockalough. This 20 km journey is expected to take about five hours and is not for the fainthearted. Even though the ascents are gradual some prior training will be needed. The walk is about 40% public road, 40% farm and forest roadway and 20% field. The first 6 km is on road and some walkers may wish to change their footwear at this point. There will be accompanying cars to carry knapsacks along all of the route and a free shuttle bus to return walkers to Thurles afterwards. The starting point is Sarsfield’s Social Centre behind Semple Stadium, leaving at 10.30 a.m.
Another long and scenic walk begins in Hollyford at 10.30 a.m. This is the 14 km Hollyford-Red Hill walk and includes visits to the hideout and burial place of the famous raparee, Eamon an Chnoic. Meanwhile back in Upperchurch the popular Eamon an Chnoic 8 km walk starts at 12.30 p.m. and a 5 km Fun Run round the local bog track is at 2.00 p.m. There will be plenty of indoor entertainment as well starting with the Seisiún Mór in Kinane’s on Friday night. On Saturday there will be Set Dancing lessons in Oliver Ryan’s at 4.00 p.m. with traditional music at Jim o’ the Mill’s at 10.00 p.m. In between at 8.00 p.m. in Pa’s Bar the local annual Culture night takes place with classical music, opera, film, drama, art, craft and such like activities to be enjoyed. Admission is free to all indoor events. Full details are on the brochure available in local outlets or online at upperchurch.ie or tipperaryheartland.ie. 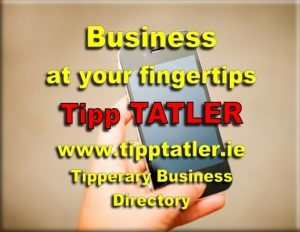 or phone 086 0518934. The organisers wish to thank all our volunteers, the local landowners and Upperchurch Hall Committee, Hollyford Hall Committee and Sarsfield’s Social Centre.